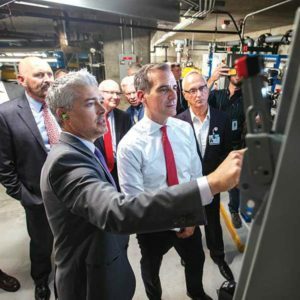 Los Angeles Mayor Eric Garcetti highlighted Cedars-Sinai’s groundwater conservation program, calling it an example of innovative conservation as the city seeks to reduce water consumption. The project has slashed the medical center’s use of city-supplied water by 29 million gallons annually, the equivalent of supplying 267 single-family homes with water for a year. The system, developed by Cedars-Sinai and an outside contractor, Rethink H2O of Chapel Hill, North Carolina, captures water flowing through an aquifer beneath the medical center. The system cleans the water and pumps it to help cool the hospital’s air conditioning. The processed groundwater is not used for patient or staff purposes. It is expected to be used for irrigation in the near future. By tapping the groundwater flowing beneath the medical center, Cedars-Sinai has cut the amount of water it purchases from DWP by about 80,000 gallons a day, or 29 million gallons a year. The project was honored earlier this year with the Water Efficiency Project of the Year award from the Los Angeles Better Building Council. 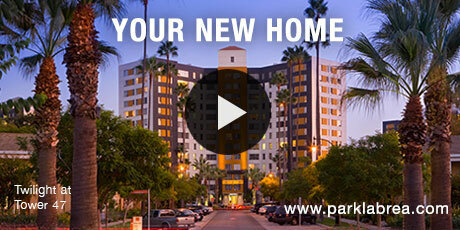 The project, which cost $1.2 million to design and build, has slashed Cedars-Sinai’s water bill by $365,000 a year. The conservation effort has attracted the attention of the DWP, which provided a $155,355 incentive through its Technical Assistance Program. The program offers rebates for the installation of water-saving projects and equipment to commercial, industrial and institutional customers as well as multifamily residential customers in Los Angeles.